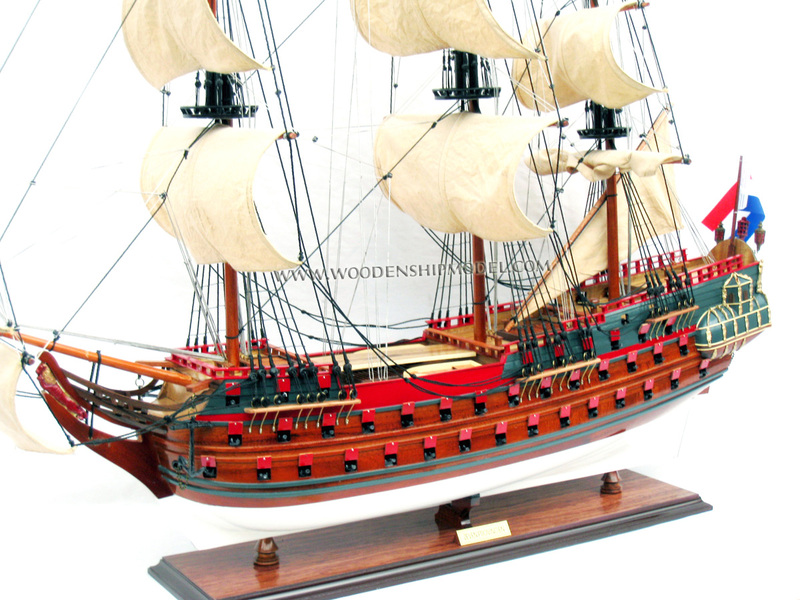 Our model is handcrafted from hard wood with planks on frame construction and has natural wood finished. This model is not a kit and ready for display. 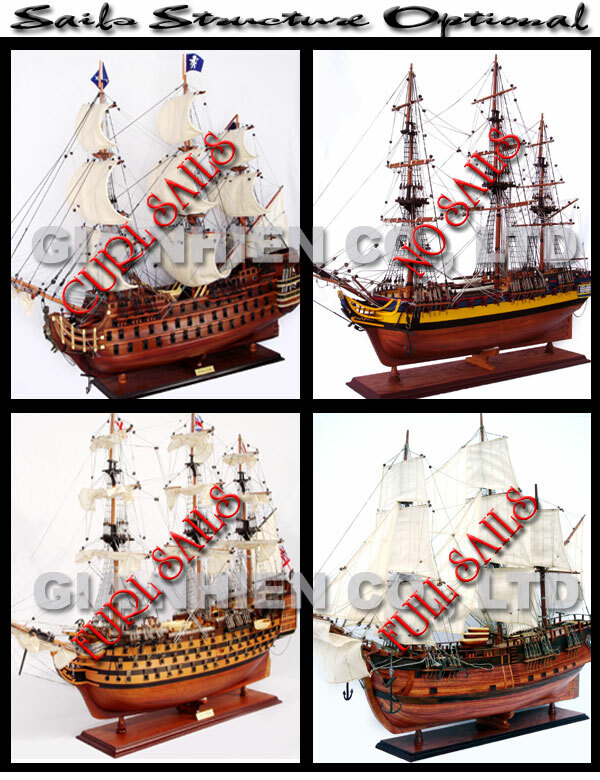 We also have available with al natural wood finished model. Click here for more photos. 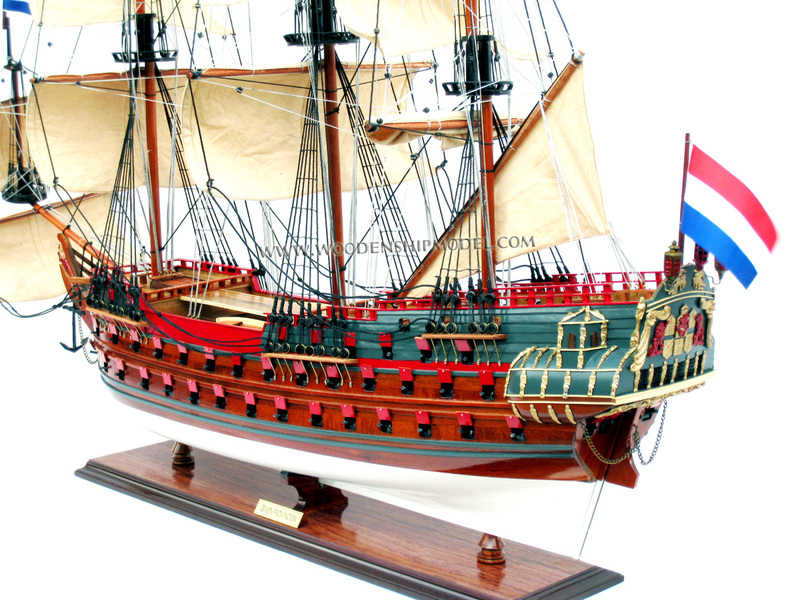 De Zeven Provinciën (Dutch: "the seven provinces") was a Dutch ship of the line, originally armed with 80 guns. 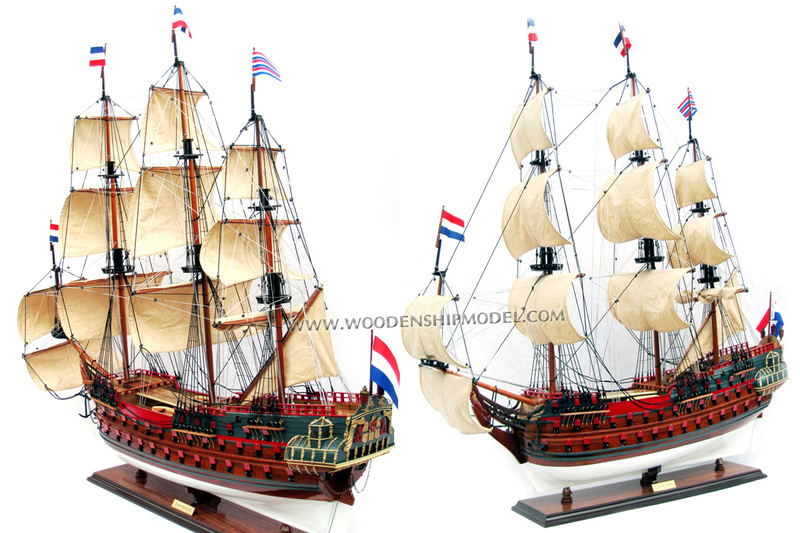 The name of the ship refers to the seven autonomous provinces that made up the Dutch Republic in the 17th century. The vessel was built in 1664-65 for the Admiralty of de Maze in Rotterdam by the master shipbuilder Salomon Jansz van den Tempel. 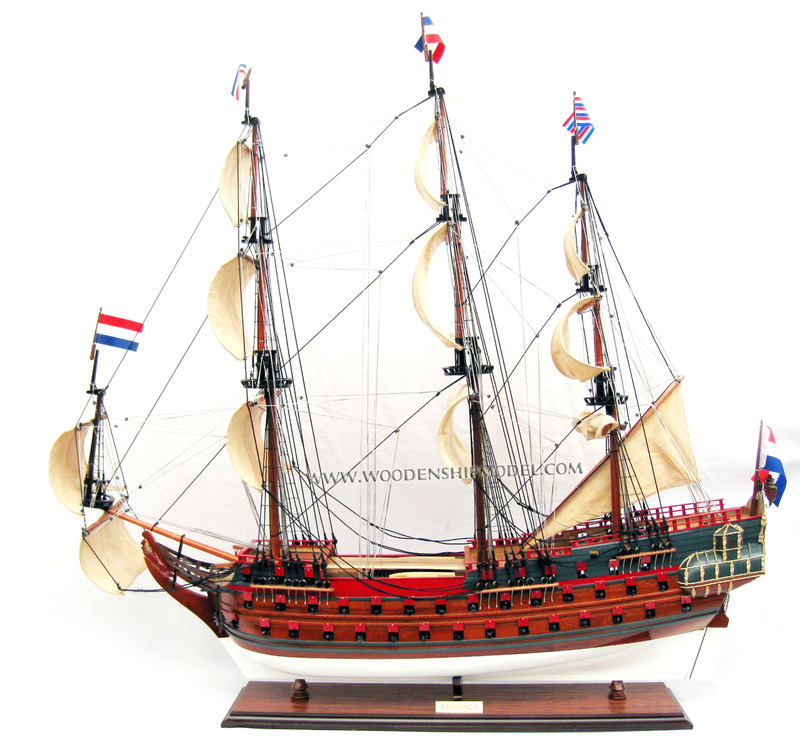 The ship served as Admiral Michiel de Ruyter's flagship during the Second Anglo-Dutch War, taking part in the Dutch victory at the Four Days Fight and the defeat at the St. James's Day Battle, and acting as a command post as well as blockading the River Thames during the Raid on the Medway. 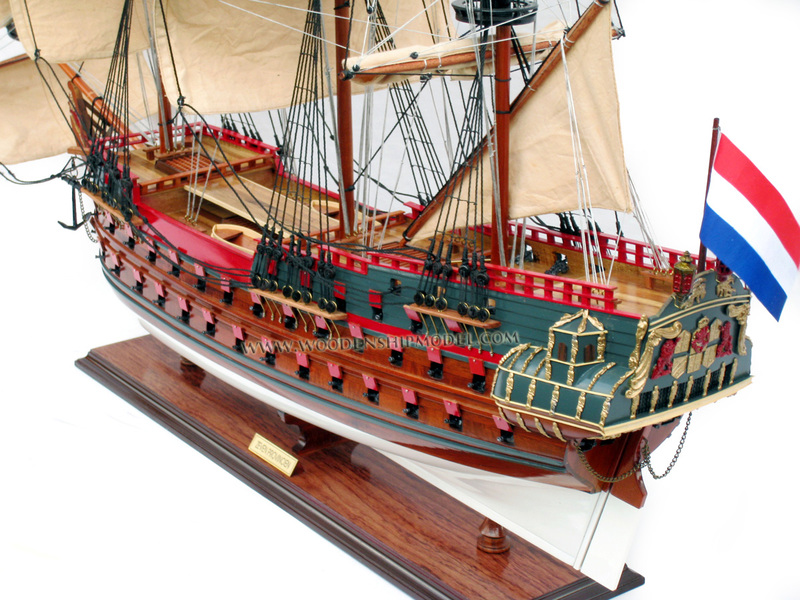 The vessel performed well throughout the war, though it was partially dismasted during the Four Days Fight. 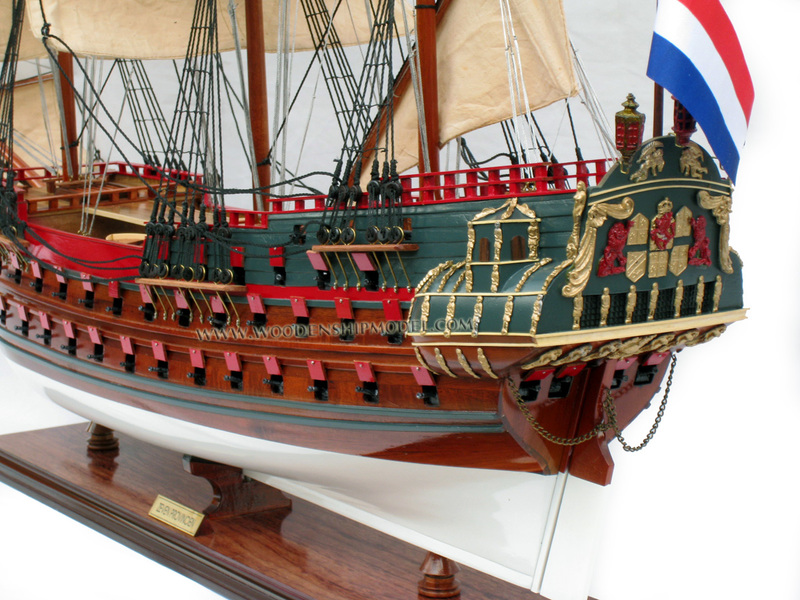 De Ruyter used De Zeven Provinciën as his flagship during the Third Anglo-Dutch War of 1672-1673. 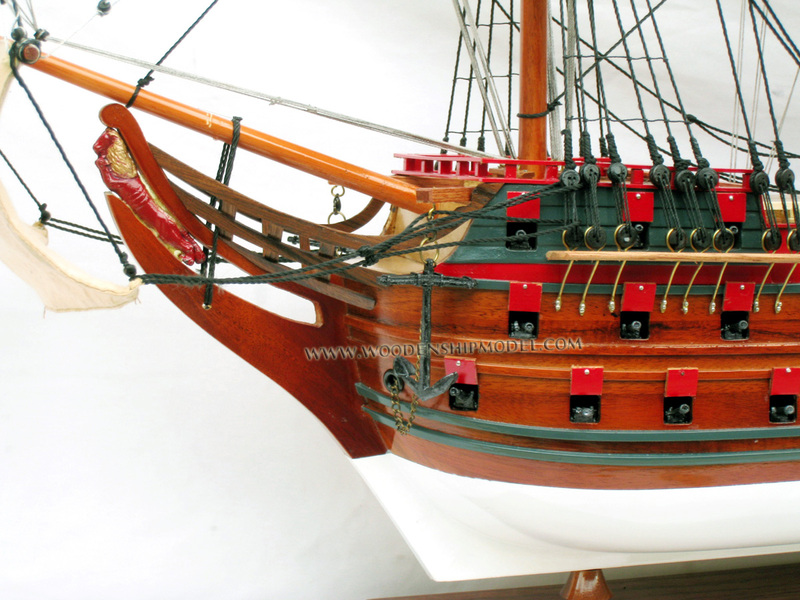 The ship served in all four major battles against the combined English and French fleet, fighting in the Battle of Solebay, the first and second Battle of Schooneveld and, in possibly its greatest moment, the Battle of the Texel. 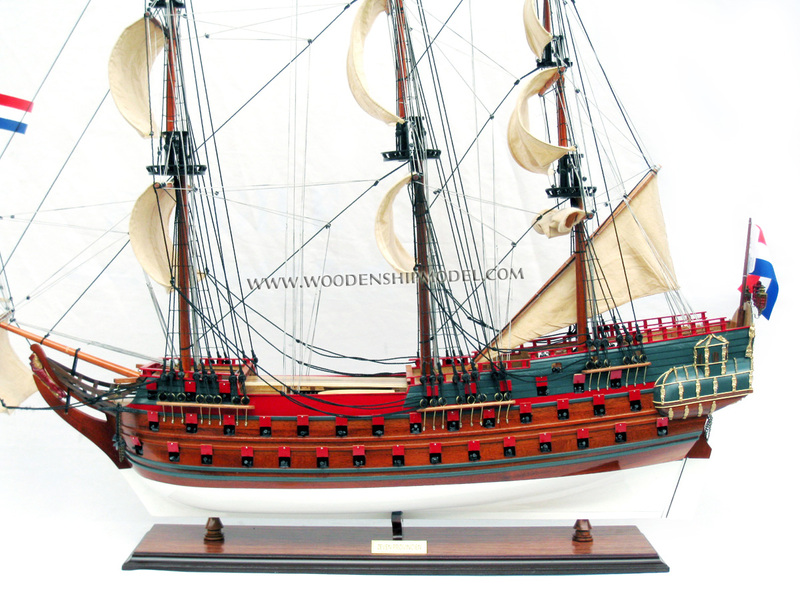 In 1674 the ship visited the West Indies. 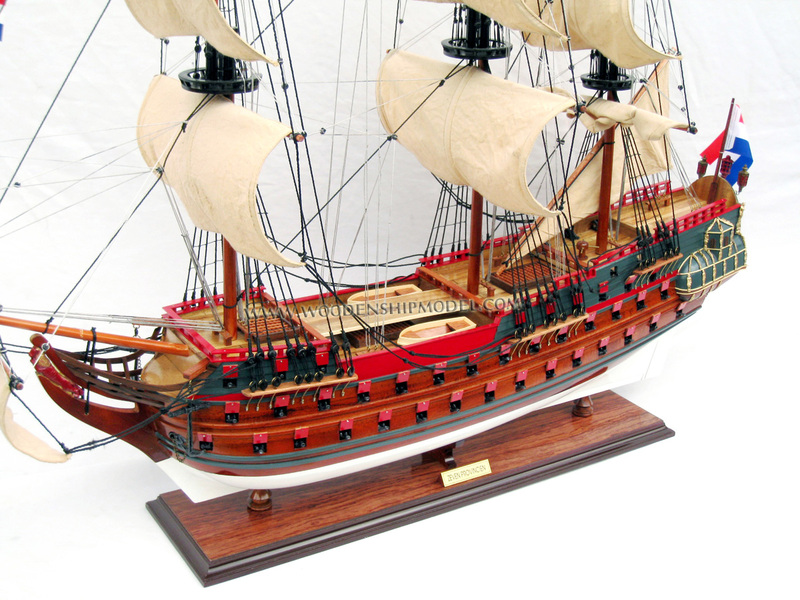 In 1692 the ship, now armed with only 76 guns, fought at the Battles of Barfleur and La Hogue during the War of the Grand Alliance. 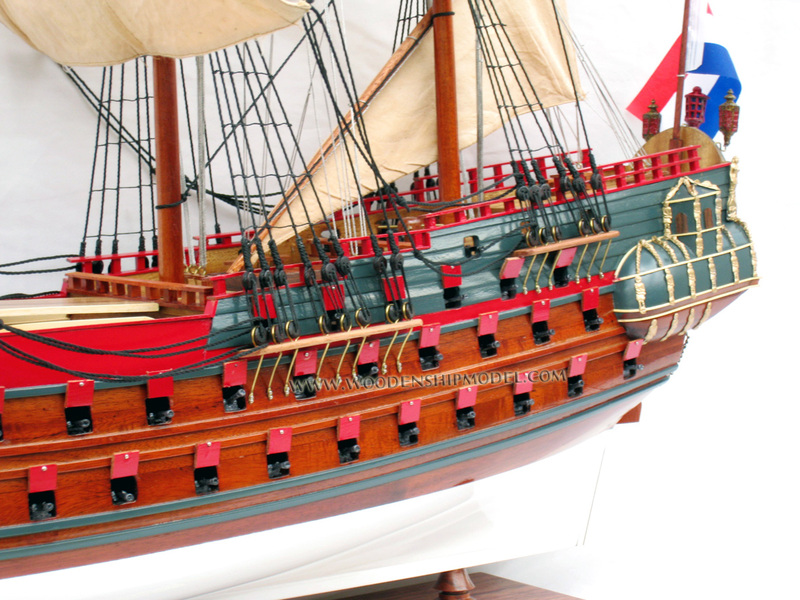 The vessel was severely damaged during the fight and, in 1694, De Zeven Provinciën had to be broken up. De Zeven Provinciën was 151 ft (46 m) long and 40 ft (over 12 m) wide, and had a draft of over 15 ft (c. 4.7 m). It was 1600 tons and had a crew of 420. It was originally armed with twelve 36-pounders and sixteen 24-pounders on the lower deck (although this had changed to an all 36-pounder battery by the time of the Third Anglo-Dutch War), fourteen 18-pounders and twelve 12-pounders on the upper deck, and twenty-six 6-pounders on the forecastle, quarterdeck, and poop deck. 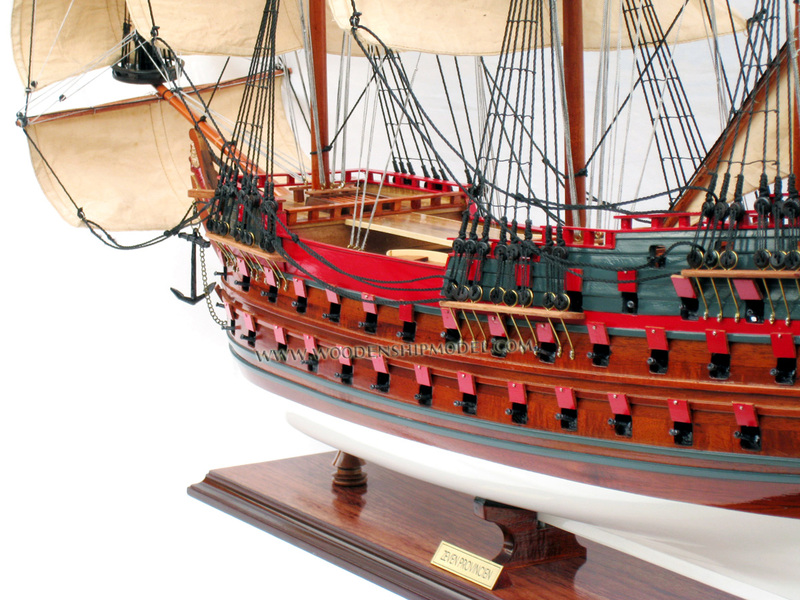 In 1995 a full-size replica of the ship was started at the Batavia-werf (docks) in Lelystad; but due to severe technical problems that work was completely wrecked. In 2008, a new replica began to be constructed. On the evening of October 13, 2008 a fire ripped through the Batavia-werf. Although the sailmaking shed, several office buildings and part of a restaurant were destroyed, as were the sails of fellow replica ship Batavia, the replica of "De Zeven Provinciën" nearby was undamaged. In 2014 work on the ship stopped due to lack of funding. Note: Our craftsmen are always choose the color of wood to be consistence. However, the natural color of the wood use sometimes is not 100% exactly the same with the photos.